Dreams Punta Cana is one of our diamond Weddings in Punta Cana resorts. Dreams weddings are known for their picture perfect receptions and Dreams Punta Cana won't disappoint! Dreams Punta Cana weddings resemble all Dreams destiantion weddings: stunning views, attention to detail and awe inspiring reception setups. A wedding at Dreams Punta Cana will not disappoint. Their events coordinators are top notch and with the relationship that All Inclusive Resorts has with this hotel we're able to customize weddings to deliver the perfect Punta Cana wedding that our clients have always dreamed of. The beach at Dreams Punta Cana is an unending ribbon of white sand and clear turquoise Caribbean waters. Many of our clients decide to have their Dreams Punta Cana weddings right on the beach to take advantage of the great photo ops and the unforgettable feel of sand between your toes while you're saying your vows. Not only are the reception setups breath taking at Dreams, but the resort has very wisely figured out that the path to a guests' happiness is through their stomach. This is a five star luxury resort and so is the food. Your guests will not tire of the international cuisine and even the pickies eaters will find something to satisfy them. Dreams is a neat hotel for a destination wedding just because they have so many different room categories to satisfy your guests. Their standard suites are exquisite and incredibly well appointed and their honeymoon suites will leave you not wanting to leave. They are also one of the few 5 star resorts with Family suites. More and more often with destination weddings entire families are invited. Kids are a little tough to deal with at traditional weddings - they either steal the show or spoil it. But they seem to fit right in at Punta Cana weddings and most resorts aren't set up to deal with families that have more than 2 kids. When planning your Dreams Punta Cana weddings we'll discuss all of the upgrades possible with you. The wedding packages can be a little misleading and fool prospective couples into thinking that they're getting a free Punta Cana wedding or that certain things are included when they aren't. Read the package very carefully! There are several different arrangements and setups for your destination wedding ceremony. The actual setup, decorations and floral arrangements can be chosen during your walk through upon arrival. The main decisions you need to make when booking your wedding is whether you'd like the ceremony in the wedding gazebo or on the beach. Both are beautiful: the wedding gazebo is very impressive and their beach setups are quite elegant with white linen chairs and a floral archway. Dreams Punta Cana weddings pictures are available on our picture page. 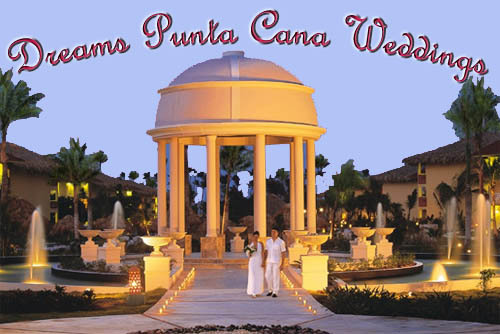 Our Dreams Punta Cana weddings are executed with precision for 2 reasons. First, the amount of work that we put into the planning beforehand to make sure that everything is set up the way you want it. Second, their events coordinators are excellent. They do a wonderful job of putting our requests into action and are able to fix any problem that pops up while you're there. 1. Remember that if you book all of your rooms through All Inclusive Resorts we will take care of your Punta Cana wedding planning for FREE. 3. If you like we can also plan excursions and activities for you and your guests during your stay. 4. Basically, we'll do everything we can to make sure that your wedding at Dreams Punta Cana is the day you've always dreamed of. 5. Working with Nancy K for your Beach Wedding in paradise is a win-win situation. You get the lowest prices on your rooms and personalized wedding planners to walk you through all the ins and outs of planning a Caribbean beach wedding. Imagine that, Dreams Punta Cana weddings at the lowest rates and FREE destination wedding planning. 6. Warning: Punta Cana wedding dates start to disappear over a year in advance. Ask us about securing your wedding date with the hotel right away. Give us the word and we'll lock up a date for your Dreams Punta Cana weddings. Ask us to Price your Dreams Punta Cana Weddings today and we’ll start the process of making your dream wedding in paradise a reality. This package cannot be combined with the Dreams Eternity Honeymoon Package. Restrictions/exclusions: Subject to availability and double occupancy only. *Important notes: 300 U$ cost for the service of the judge not included. To be paid upon arrival. Cost is subject to change without previous notice. Gazebo décor: Chairs with white covers, ceremonial table & red carpeted walkway. color, B/W or sepia 5 x 7 photographs, CD with selected 50 photos. or sepia 5 x 7 photographs, CD with selected 100 photos, etc. photographs, reception coverage , etc. All additional items (extras) must be paid directly to the hotel and are not commissionable. On Food and Beverage services a 15% service fee applies. After 20 people a supplement will be charged per extra person. On Food and Beverage services a 15% service applies.